The Amateur Traveler talks to Noah Lederman of SomewhereOrBust.com about his recent trip to Cambodia. Noah was drawn to Cambodia because of some of the dark recent history as he research a character for a novel. But while drawn to its darker side Noah also visited the beautiful Anchor Wat near Siem Reap, meeting the tuk tuk driver early in the morning to see the sunrise over the massive temple complex. 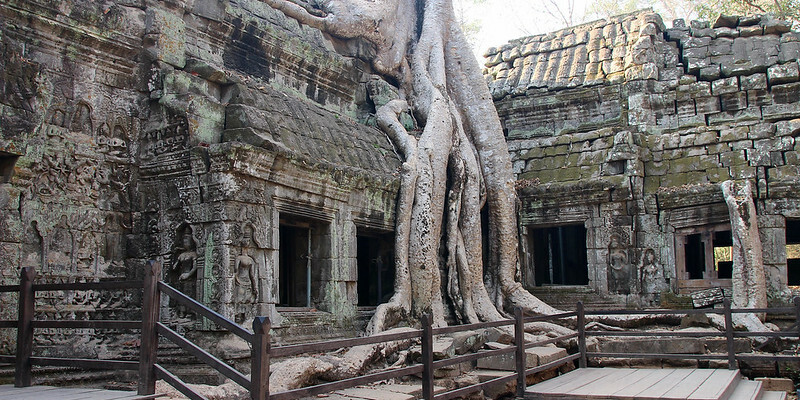 He traveled as far as the lesser visited temple of Banteay Srei as well as Ta Prohm the “tree temple”, Preah Khan and Ta Sam. Noah also relax on Rabbit Island near Kep, Cambodia as well as visiting the “Crab Market” there and also traveled to Battambang where he road on the bamboo trains. 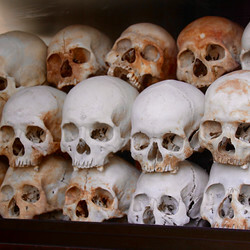 He also visited Phnom Penh with its night market, the royal palace as well as the sobering Tuol Sleng – S21 memorial. Link to the MP3 just links back to this page. Sorry about that, for whatever reason the mp3 file link simply wasn’t there. Fixed. I live in Siem Reap, Cambodia and I love this place. Angkor Temples are the ones you must see when travelling around the South-East Asian countries. If anyone needs some help, e-mail me and I can help you out with some stuff ;-). Thanks for listening to the interview (and thanks for having me on Chris). Right after we ended, I realized there was one other must-do point that I forgot to make. If you’re visiting the Angkor Wat complex and you enjoy riding bikes, rent one for the day. You’ll feel the pain in the evening, but it’s a great way to experience the temples. A bicycle allows you to visit some of the temples you probably wouldn’t choose to see with a tuk tuk. 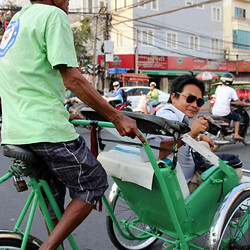 (With a bike, you can venture beyond some of the parking lots, which is as far as the tuk tuks can bring you.) On bike, you can quickly scope out the perimeter and decide if that particular site–there are many–is worth your time. If you have any other questions, feel free to ask. There are a few other tips that time or memory would not allow, so feel free to check out my site: Somewhere Or Bust. The link is at the top of the page. Happy Travels. Wat a great episode! I was in Cambodia 1 week in 2008 and loved it. Very similar impressions and experience to Noah. Amazing kind people, tough recent history. Spend time there! I spent 4 nights and 3 full days at Angkor Wat – one by bike, one by foot, and one with driver. The earlier (sunrise) the better (less people). I tried the cable-tied hot air balloon for vistas across the Siem Riep plains and Angkor Wat – maybe not worth it, but cool nonetheless and good perspective. My episode on Laos is a good companion piece (#199) http://asia.amateurtraveler.com/2009/09/12/travel-to-laos-episode-199/. I highly recommend SE Asia above and beyond most other travel destinations.